Below are quickie reviews I posted on the Riderwearhouse/Aerostich website of its Windblock Jersey. The first time I showed up at work wearing the tan jersey (left), my boss thought I looked like Captain Kirk. Hmmmm, I wonder if these could be marketed to geeky cosplaying Trekkies? I received my Windblock Jersey yesterday afternoon. The Medium fit my 5'9" 168# frame very well. The jersey is extremely well constructed and looks nice enough -- the black cuff and neck bands contrast well with the tan fabric. When I left for work yesterday it was 42F; I was in my trusty 10-year old Darien jacket & pants w/ fleece liners, a long-sleeved cotton T-shirt, and a neck gaiter. Nothing else but briefs -- I seldom wear "street clothes" under my riding gear. This morning it was also 42F when I left, so I have an excellent basis for comparison. 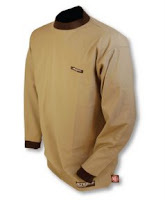 I substituted my Windblock Jersey for the long-sleeved cotton T-shirt; all other gear remained the same. This jersey works! I noticed the lack of airflow around my torso, and resulting warmth. I'm certain the difference will increase as the temps decrease over the next few months. As I ride throughout the Winter, this jersey will see a lot of use. Hmmm, maybe I better buy a 2nd? See above. I wear mine so often I did buy a 2nd. As great as the first one I bought...only bluer.